Southern California’s Mount Wilson is a lonesome, hostile peak — prone to sudden rock falls, sometimes ringed by wildfire — that nevertheless has attracted some of the greatest minds in modern science. George Ellery Hale, one of the godfathers of astrophysics, founded the Mount Wilson Observatory in 1904 and divined that sunspots were magnetic. His acolyte Edwin Hubble used a huge telescope, dragged up by mule train, to prove the universe was expanding. 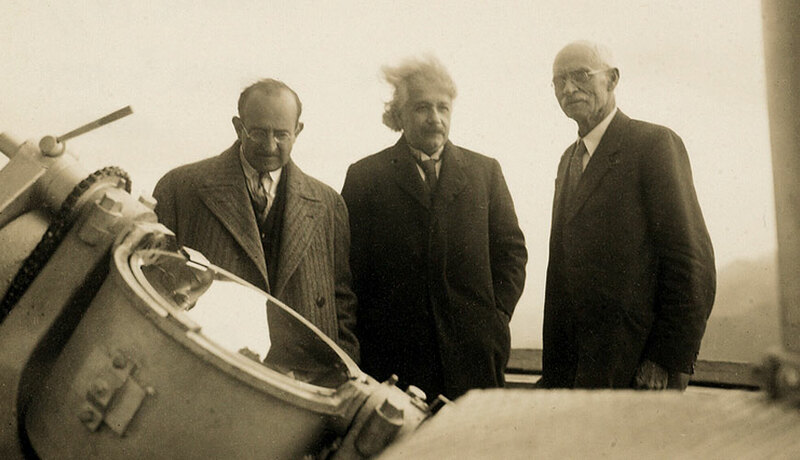 Even Albert Einstein made a pilgrimage in the 1930s to hobnob with the astronomers (and suffered a terrible hair day, a photo shows). John MetcalfeLos Angeles on a “clear” day, as seen from atop the CLARS monitoring station, which remotely tests the atmosphere above more than two dozen points in the Los Angeles Basin. Today, Mount Wilson is the site of a more terrestrial but no less ambitious endeavor. Scientists from NASA’s Jet Propulsion Laboratory in Pasadena, Calif., and elsewhere are turning the entire Los Angeles metro region into a state-of-the-art climate laboratory. From the ridgeline, they deploy a mechanical lung that senses airborne chemicals and a unique sunbeam analyzer that scans the skies over the Los Angeles Basin. At a sister site at the California Institute of Technology, researchers slice the clouds with a shimmering green laser, trap air samples in glass flasks, and stare at the sun with a massive mirrored contraption that looks like God’s own microscope. These folks are the foot soldiers in an ambitious interagency initiative called the Megacities Carbon Project. They’ve been probing L.A.’s airspace for more than a year, with the help of big-name sponsors like the National Institute of Standards and Technology, the Keck Institute for Space Studies, and the California Air Resources Board. If all goes well, by 2015 the Megacities crew and colleagues working on smaller cities such as Indianapolis and Boston will have pinned down a slippery piece of climate science: an empirical measurement of a city’s carbon footprint. If that doesn’t sound like something Einstein would scarf down energy bars and hoof up a mountain to check out, give it time. It promises to be a groundbreaking development in the worldwide fight against global warming. John MetcalfeThis is a Solar Fourier Transform Spectrometer at Caltech, which scientists are using to study greenhouse gases. Historically, researchers have tried to understand anthropogenic global warming by looking at it from the big picture — first across the planet, then by regions and countries. But two things happened in the past few years that turned their frame of reference. First, they realized that the emissions of a large landmass are extremely difficult to measure. The signal from fossil fuels gets tangled up in a bunch of other things, such as byproducts from the natural ecosystem and agriculture. Second, they encountered a rash of enthusiasm-killing gridlock in the United States government, with the 2009 Copenhagen climate talks ending in a muddle and a 2010 cap-and-trade bill dying in the Senate. It became clear to environmental stakeholders that if any policy was going to happen on cutting emissions, it was going to be at the scale of states and cities. So climate scientists began to sniff around megalopolises. It makes sense: That’s where all the people and resources are. They now suspect that cities are some of the worst offenders when it comes to generating greenhouse gases, especially so-called megacities with more than 10 million residents, like Los Angeles, New York, Tokyo, and Mumbai. Urban areas and their enabling power plants are thought to pump out about 70 percent of humankind’s total fossil-fuel emissions. Cities will only become more important in the climate debate as the years roll by. With the world’s urban population expected to nearly double by 2050, the boom in development could release a flood of greenhouse gas, as more city dwellers torch colossal quantities of coal and oil to power their cars, feed their stoves, and crank their air conditioners. Of course, many studies indicate that city dwellers create a lesser environmental footprint per person than their suburban counterparts, as urbanites tend to take mass transit and live in smaller homes. But cities, being small and potent geysers of greenhouse gases, are an ideal place to target solutions. It’s a complex problem. A major issue is that governments estimate the volume of emissions with indirect measurements, such as tracking the carbon output of power plants or surveying the number of people riding mass transit or buying gasoline. Nobody is really testing greenhouse gases above cities on a focused, long-term basis, which is crucial in verifying whether the measurements urban governments use to make policy decisions are accurate. Los Angeles’ municipal government has a natural interest in this line of inquiry. Since it adopted a climate plan in 2007, the city has met Kyoto Protocol reduction targets in part by taking thousands of diesel trucks off the road and screwing energy-saving LED bulbs into 140,000 streetlights. Officials want to cut emissions 35 percent from 1990 levels by 2030, and to do that they’re going to need a good verification system. One morning in January 2013, I pile into a Toyota Prius with Duren and Megacities colleagues Stan Sander and Eric Kort and take a spin up the rock-strewn roads of Mount Wilson. The trees are all scorched and leafless from the last forest fire, so there’s an excellent view of the smog. It looks like a volcano vomited up an ocean of brown foulness that spread over the L.A. Basin and now is lapping against the foothills of the San Gabriel Mountains. The Greater Los Angeles Area of the 21st century is home to 19 million people living among 34,000 square miles of clunky concrete buildings, griddle-hot parking lots, and sad spits of green space. It’s not only America’s smoggiest region but also a breeder reactor for greenhouse gases. Prodigious plumes of carbon dioxide waft up from car-clotted highways and belch from factory smokestacks. Methane pours from landfills, sewage-treatment plants, and large dairies to the east (a contented cow can produce hundreds of liters of methane daily). And although they’ve cut emissions greatly, the ports of Los Angeles and Long Beach are still powerful emitters, with their bunker fuel-burning cargo ships, bulky loading cranes, and busy dockside traffic. On a typical morning, ocean breezes blow this noxious chemical gumbo into the mountains to the east. There, at the pinnacle of Mount Wilson, the vapors seethe at the doorstep of a curious object called the California Laboratory for Atmospheric Remote Sensing, or CLARS. John MetcalfePart of the Megacities team at the CLARS facility in Pasadena. Left to right: Thomas Pongetti, Riley Duren, Eric Kort, Stan Sander. The observatory is a big white dome with a furry black fringe running around its base, like a mustacheod R2-D2, sitting atop a shipping container. The container was dropped onto the mountaintop several years ago by helicopter, and today it’s outfitted with scads of high-priced equipment and a technician who lurks in the gloom. Every couple of minutes, the dome whirs and spins to point at a distant target below. A mirror in its curvature reflects a sliver of sunlight downward, where a spectrometer dissects it into different elements. The dome then whirs to the next point in its 27-spot rotation around the basin. Scientists had expected emissions to be fairly uniform, given the region’s flat topography. But CLARS picked up a number of hot spots with abnormally high concentrations of methane — an incredibly potent climate-change agent — in north Orange County and the City of Industry. The Megacities people are just beginning to identify the vapor sources for these anomalous zones. Emissions of questionable origin are called fugitive emissions, and they account for a decent-sized hunk of any city’s overall greenhouse-gas output. L.A. officials estimate that the city’s yearly carbon footprint weighs 39 million tons, with this breakdown: 43 percent vehicle emissions, 21 percent commercial buildings, 19 percent municipal energy use, 16 percent “industrial fugitive or other,” and 1 percent wastewater. Behind the CLARS facility is a rattling, wheezing shed that houses a Picarro, an air-sampling device that displays real-time readings of ambient gases. Sander looks concerned over a sudden spike in CO2 on the machine’s monitor, then realizes it’s simply us, exhaling. This is another component of Megacities’ full-court press: a network of a dozen or so Picarros going up this year in different L.A. neighborhoods, where they will ceaselessly inspect the air for greenhouse gas. A planned satellite component adds another layer of detection. John MetcalfeA Picarro sampler sniffs the air on Mount Wilson for C02, methane, and other potent climate-altering emissions. Only one spacecraft in orbit right now is monitoring greenhouse gases, Japan’s Gosat (Greenhouse Gases Observing Satellite), and its resolution isn’t good enough to give an accurate picture of a city’s emissions. But in the next few years, NASA plans to launch the Orbiting Carbon Observatory (OCO-2) satellite and install a new instrument (OCO-3) on the International Space Station. Both devices will periodically take snapshots of the “chemical weather” over population centers. “OCO-3 will have a ‘city mode’ where it rapidly starts sweeping back and forth like a whisk broom,” says Duren. He expects the satellite to take some 3,000 samples over a city in just a few seconds. With this bulging grab bag of equipment, the Megacities team hopes to sculpt a model of L.A.’s emissions so detailed that they’ll be able to pull out individual signatures, such as exactly what and how much is spewing from rush-hour traffic or the port system or large landfills. Once they get an emissions baseline for Los Angeles, they hope to assist other cities in starting their own climate-reading networks. Duren’s team is already coordinating with French scientists running a Megacities sister project in Paris. (Researchers had to move a Picarro on the Eiffel Tower because its readings were skewed by steamy tourist lung vapors.) The Americans are also trying to link up with a third group in São Paulo, Brazil, which has long battled heavy air pollution. The idea is to prepare a set of climate archetypes that can be applied to different megacities. The L.A. area is on the ocean, ringed by mountains, and often holds emissions in place like a lidded bowl. Perhaps what the Megacities team learns about emissions here will also apply in Mumbai, India, which has a similar geography. In contrast, Paris’ layout makes emissions rise in a wind-blown plume. The goal is to one day have a comprehensive network for sensing greenhouse gases in all the major cities across America or even the world. With that in place, an obvious application would be capping sources of fugitive emissions. An eagle-eyed satellite might detect roiling leaks in natural-gas pipes caused by aging infrastructure, or disasters like hurricanes and earthquakes. Then cities could prioritize repair crews accordingly. If the researchers can extract the signature of freeway traffic, it could instruct a municipality how and where to build future roads, enact tolls, or allot carpool lanes. It could also alter the dialogue of commuting: If you reside in the suburbs but drive through a city every day to work, are you somehow on the hook financially or morally for spewing fumes into the greater urban cloud? That issue matters in Los Angeles, where regional commuters arguably bear environmental responsibilities “even if they don’t live in L.A.,” says Pascual of the mayor’s office. As the outlines of our individual footprints become clearer, perhaps the Megacities legacy could even motivate some of us to pull the old bike out of storage instead of reaching for the car keys. This essay appears in the ebook City 2.0: The Habitat of the Future and How to Get There, co-produced in partnership by The Atlantic Cities and TED Books.